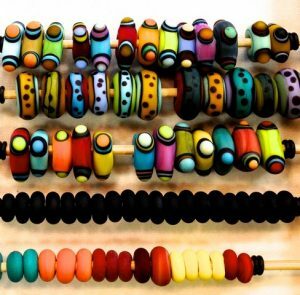 Handmade oblong beads displayed for sale. Beads are big — so big that they are celebrated not once, but twice a year right here in Montgomery County. 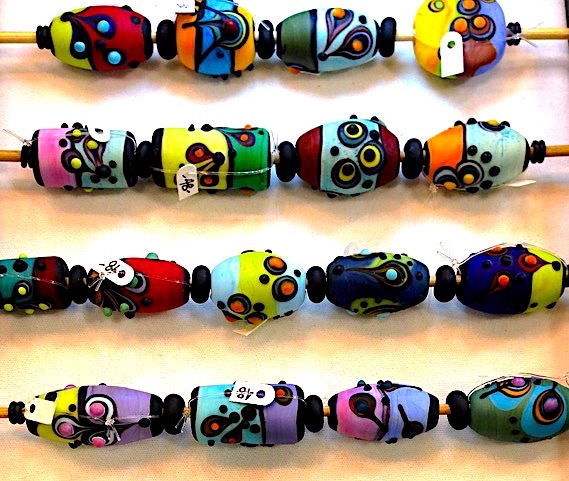 Saturday and Sunday, Nov. 10 and 11, mark the 68th Semi-Annual Bead, Jewelry & Textile Bazaar, a production of the Bead Society of Greater Washington (BSGW). The Bead Bazaar, as it is known, is like Beads & Beyond for crafters, historians and the curious. It features fabric beads, lamp beads, organic beads, textiles, jewelry, books, Swarovski crystals, and “findings” from vendors in the metropolitan area — as well as Pennsylvania and New York. What’s a lamp bead? Come find out. 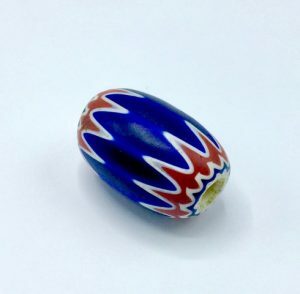 Made of glass, shell, clay, wood, stone, plastic, metal, bone, coral, horn, ivory, seeds, beads can contain more than meets the eye. They are the oldest, most universal and enduring artifacts of mankind. They are things of beauty and adornment. They are used as status symbols and protective amulets in ancient, ethnic and contemporary cultures. Beads have been touted as bridges to cultural understanding. All this in a tiny object, some as small as a grain of rice. Bead Bazaar committee co-chairs Judy Carlsson and Elaine Robnett Moore have been beguiled by beads for decades. “Almost 40 years ago, my husband and I were living in Los Angeles while he studied for and received a graduate degree in gemology. We were invited to a meeting of the L.A. Bead Society,” Carlsson recalled. 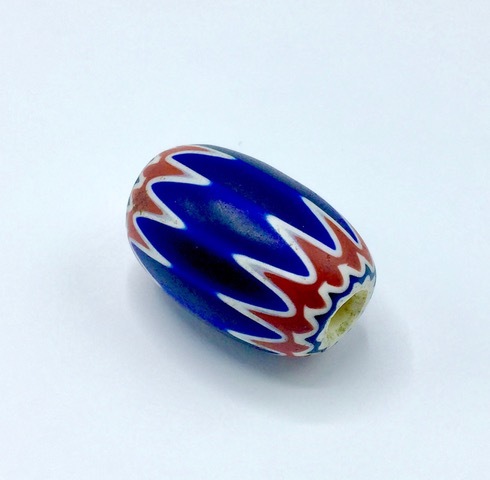 “The topic was coral… Members all wore their collections of coral beads; red, orange, pink, white and black; ancient to new; large and small; natural nuggets, smooth and carved. We learned the history of coral beads, their significance in ancient times to modern-day cultures. The co-chairs use the Bead Bazaar as a fundraiser for their passion and community of bead lovers. Proceeds from ticket sales go to the BSGW’s community outreach, history and cultural enrichment programs. Event visitors range in age, starting in their mid-20s. They are collectors, jewelry designers and jewelry makers. They come to admire and purchase items from the show. 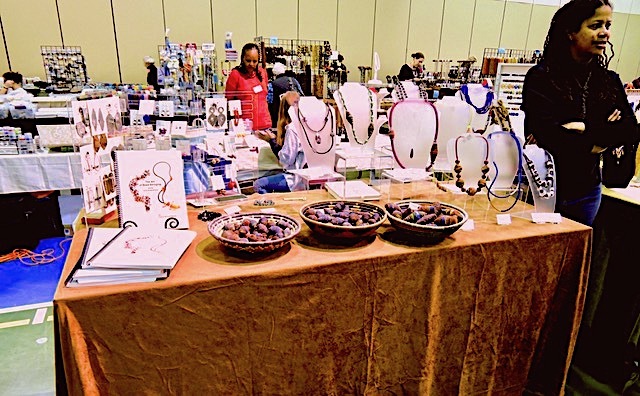 The 68th Semi-Annual Bead, Jewelry & Textile Bazaar takes place on Saturday, Nov. 10, 10 a.m. to 5 p.m., and Sunday, Nov. 11, 11 a.m. to 5 p.m., at The Activity Center at Bohrer Park, 506 South Frederick Ave., Gaithersburg. Tickets are $6; $5 with coupon from the beadbazaar.org website. Children younger than 12 are admitted free.